Today I have some stamps from the classical Period of Angola and 3 series from the 40's and 50's of Portugal...As we all know Angola was officially 'discovered' by the Navigator Diogo Cão between 1482 and 1486..The first Portuguese Governor of Angola was nominated in 1575.. Angola became an Independent state in 11 November 1975.. Since the beginning of this blog , I always said that due to difficulties with the identification of different papers, I wont talk about the classical period in Portugal (for now ,of course!!!).. With these Angola stamps, this knowledge is not yet needed, because there are other factors of selection that enable the classification, without the differentiation of the different papers by the 'simple touch' of our fingers.. And now you are asking.. Why can't he start to study this differentiation.??. 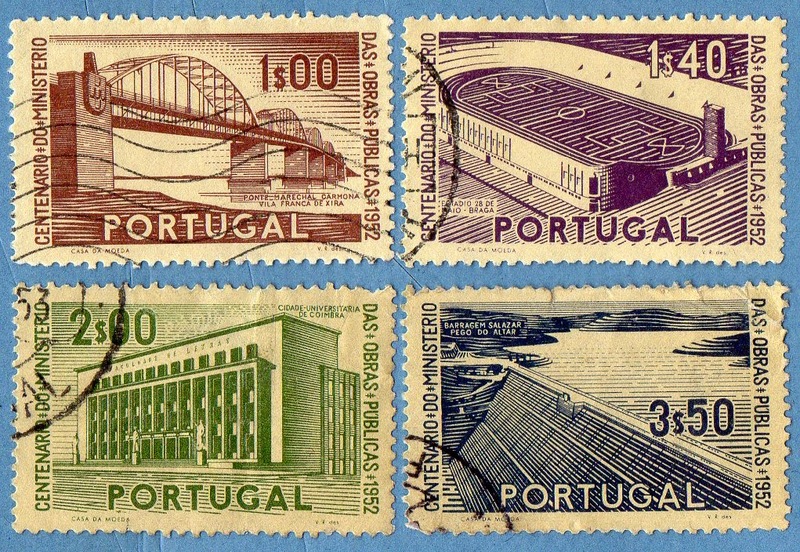 because, some of the Portuguese Classical stamps are not cheap (for my current status.. ) and to do such a study we need to have several exemplars of each stamp, before initiating a better differentiation of the different papers.. This is not yet the time.. I will start by saying again that the stamps have the same size, but this image bonding's I use to make , sometimes have a 'not so good result'.. These are stamps from 1881/1885, but the Original series was issued in 1875 (the first series of Angola stamps..).. This new series from 1881 has a different set of colors... The main factor of differentiation in all the stamps of this period is the Perforation.. in this case and just for confirmation, we need to know of the existence of two main varieties, depending on the inferior numeral labels...for the 1st stamp , we have a perf 13.5 and clearly a type II stamp.. In the first series there is a 25r variety with Color Rose and perf 13.5, with undefined type.. well this 25r stamp I present , at a first look seems to be of rose color.., but the Center seems to be violet... that is the real color we are after.. This was the opportunity we seek to know what is the color stated in the catalogs.. it is the the color of the background Crown center of the stamp and just that!! . a Violet stamp, Perf 13.5 and type II.. These are stamps from the series of 1886 "King D. Luis I"...One of the main characteristics of this series is the Embossed Portrait and labels..The stamps are printed in Porcelain Paper and the perforations could be 12.5 and 13.5...Over this series and the next one's of king D. Carlos I, there are many Overprints and surcharges.. ahead in this post we will talk about them with examples.. These are stamps from King D. Carlos I , issued in 1893/1894..In the first 3 stamps, the colors are somehow faded and seem to be behind a very dense fog... The stamps could be printed using Porcelain Paper or dotted paper.. each one of these main varieties could have 3 perforations (11.5,12.5 or 13.5)..; if , after measuring the perforations, we don't reach nothing conclusive,, we have to search if the paper is dotted or not.. it is very easy to see .. with these two information's , the classification is immediate...the last two stamps have the colors Blue on blue and blue on Orange.. The first two stamps, are from the Original Mouchon series of King D. Carlos I, issued in 1898/1901..It is for me the most beautiful D. Carlos I design.. it is designed and engraved by Eugene Mouchon, and there is nothing more to tell about this particular series.. 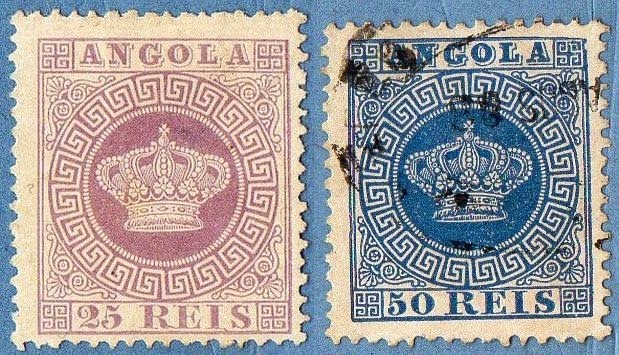 The last two stamps are surcharges over D.Luis and D. Carlos I stamps from 1886 and 1893 respectively, issued in 1902 .. there are two main varieties of these stamps , and the distinctive fact is the distance between the numeral and the Surcharge label /REIS' .. type 1 (3mm), type 2 (4mm).. The D. Luis stamps could have 12.5 and 13.5 perf..and are printed in Porcelain Paper..The D. Carlos I stamps could have 11.5,12.5 or 13.5 perf., and are printed in Porcelain , Dotted or Flat paper.. From this quick view over these D. Carlos I Surcharges, we can see that we must connect the 3 papers, the 3 perforations and the 2 Variations.. For the study and classification of Portuguese or Former colonies Classic Stamps, it is better to have a AFINSA Catalog, or one of the other catalogs existent until the 70's (Simões Ferreira,etc).. it is not possible to classify these stamps with a World catalog or a simplified catalog.. There is also a technical detail about this Overprint.. if We look for the first 2 stamps, we can see they are identical, same value, same surcharge, same color, etc.. However , the Overprint is different but it's meaning is the same .. it is written in a different way... the 1st stamp has a Overprint typographed from the Casa da Moeda in Lisbon..the 2nd stamp has a local Overprint.. The first 3 stamps are in it's original form surcharges over King D.Luis stamps, from 1902..then , they were overprinted with "REPUBLICA" in 1914 and 1915.. in 1914 we had the Local Overprints and in 1915 the Casa da Moeda Overprints..
well, this quick passage over the New entries for Angola is ended , and now I will show 3 series from Portugal that I bought some days ago, because they were at a very low price (I had ti buy them...).. 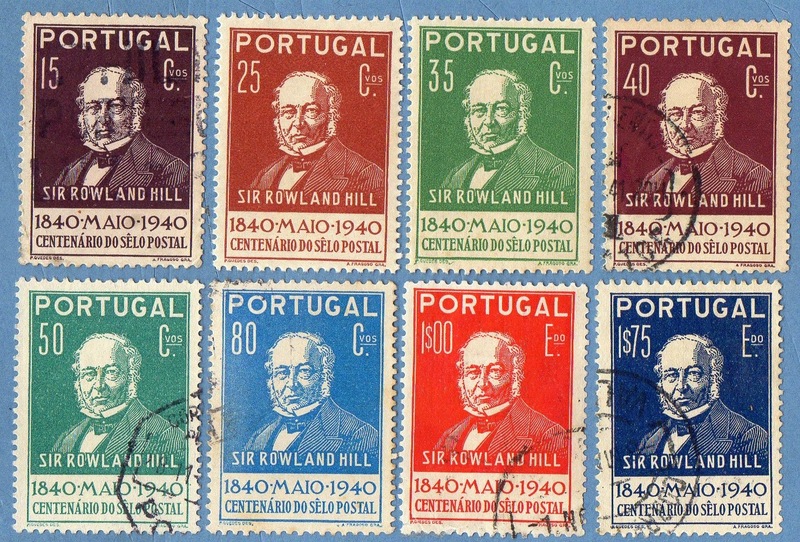 This is a series from 1940 that presents Sir Rowland Hill , one of the most represented personalities in stamps of all over the world..